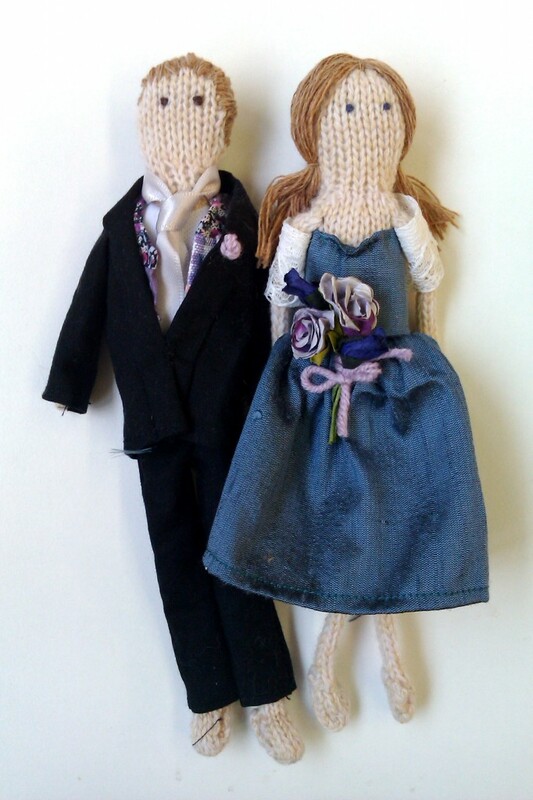 Celebrate the most momentous day of your life with two personalised handmade dolls by Laura Long. Each one is lovingly hand knitted and dressed in clothes carefully created using selected vintage fabrics. Laura will work closely with you to match the style, colour and detailing of your outfits. If you have any leftover material from the real wedding dress or suit, Laura can use this for the dolls’ clothes. Skin, hair colour and flower colours can also be altered to make the perfect Bride and Groom. When ordering your dolls, the more details you send Laura, the better. If you have a picture of your dress or suit, a swatch of fabric or a website link with details of the outfits, please let Laura know. She will use these to match the dolls to their real-life counterparts as accurately as possible. You may use the option below to attach a photo file. The happy couple are beautifully presented arm in arm in a gift box. Dimensions: Each doll is approx. 18cms tall. The price includes both dolls – please note, you can order Bride and Groom, Bride and Bride, or Groom and Groom.